This is the story of two little girls; their families, their therapists, Hope Therapy Center and the thread of connection between them all. I met Karina when she was 2 years old, still in pull-ups, and very full of life. An unforgettable memory for me is guiding Karina to learn her first signs. I remember her sitting in my lap while we held a large board book of animals; I moved my hand across the bottom of the page to sign “fish” and her tiny little hand came behind mine to sign “fish” as well. She looked up at me to let me know she understood that what she did with her hand matched the picture on the page. Karina’s first sign and I was there to see it! Mariah and I met when she was 4 years old. She had received her first cochlear implant at age 2 and she was learning spoken language. I saw right away what a smart little girl she was. At the age of 5 she received her second implant. She had learned sign language at a very young age and signing was her first and most dominant language, but I certainly remember when she said my name for the first time, it was incredible! I was amazed at her bright little mind and how quickly her hands would move with signs and how she would work so hard to produce the spoken word. 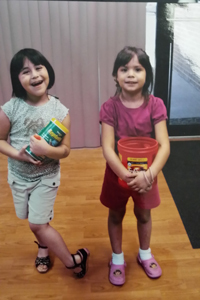 At the age of 3 and 4 Karina and Mariah’s paths crossed and they became steadfast friends. They seemed to have understanding far beyond many of us into how they were connected by all the things that were “alike” about them and they rarely focused on their differences. I have watched them over the years have funny arguments, cry, and hug and sign “sorry friend”. I have also seen them grow together, lean on each other, work and play together. When I asked them what they liked about coming to Hope they both said “being here together” and they named their therapists, front office staff, other friends and all the faces of Hope they see when they come through the doors. Along with these precious little girls I had the privilege to meet and get to know their families. Dedicated moms who were willing to do whatever it took to help their daughters have the best life possible. 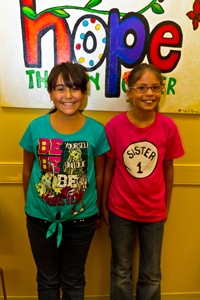 As a member of the Hope Family, you’ll experience the journey of a lifetime.